Online party invitations are the easiest way to inform and impress your guests. 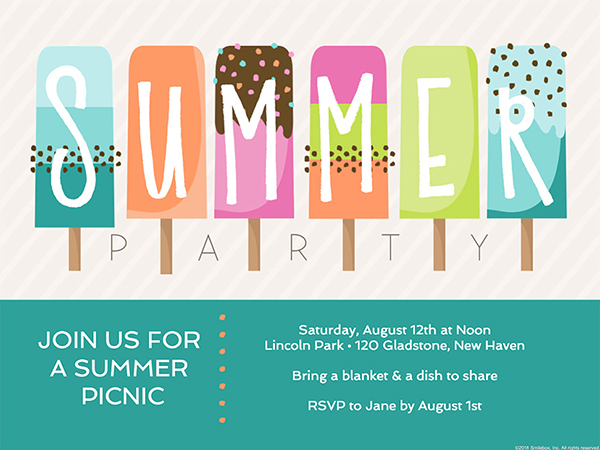 Smilebox online paarty invitations have got you covered! Letting your friends know about your event is absolutely essential, but with our free party invitation maker, that’s one thing that’s quickly taken care of. In moments, our online party invitation maker produces an impressive party proclamation that also serves as an RSVP service. This party invitation maker is super simple to use. Our intuitive free party invitation maker only requires a few steps to create an online party invitation that looks like a professional made it. Starting with our huge choice of online party invitation maker templates, you can customize a design with the prefect photo and all the information about your upcoming affair. Once you personalize your online party invitation, share it with guests any way you like. You’ll really notice the convenience of our free party invitation maker whenever you want to communicate. From a “save the date” notice, to an RSVP service, and to a final reminder, all it takes is a few clicks to update the template you have saved with the online party invitation maker. Want to know how simple it really is? See for yourself, below! Smilebox has designed a wide selection of online party invitation templates with a range of themes that’s sure to include one you like. Choose your preferred look and then click “Personalize”. No matter where your photos are stored, Smilebox lets you sort through them to find the one that really matches the online party invitation template you have chosen. Simply click “Add More Photos” in the free party invitation maker to see all the pictures you have saved on your phone, social media accounts, and computer. Edit the text that you see in the free party invitation maker according to the time and place of your event. Of course, you can also try different color schemes and fonts to achieve the right look. You can even include music with your online party invitation. Every change that you insert can be instantly seen in the online party invitation template. Take a final look at the online party invitation that you have created and then finalize it. We suggest that you save a copy on your computer if you want to send messages to your guests later on using the party invitation maker. Send your online party invitation using email and social media, or you can save it to your computer and print it. Party invitation maker from Smilebox can accommodate any kind of affair. From sleepovers to a debutante ball, the free party invitation maker can personalize a card that delivers just the right message. As a starting point for your creation, our online party invitation maker provides a large selection of templates for you to customize. Try it today! You can experiment with our free party invitation maker and view our dozens of designs and easy-to-use program. You can also share your online party invitation with friends, and then enjoy the compliments that follow! When you use the free party invitation maker, you create a memento of good times that you have made for yourself and others. Keeping all the online party invitations from over the years results in a treasure trove that will bring back fond - and maybe some wild - memories. With Smilebox, this can be true of other occasions as well. Take a peek at our invitation makers for holidays, milestones, and personal celebrations. Each has the same wide choice and user friendliness of our free party invitation maker.